Heat oven to 350°F (325°F for dark or nonstick pan). Make and bake 1 cake mix as directed on box for 2 (8-inch) round pans, using water, oil and eggs. Make and bake second cake as directed on box for 13x9-inch pan. Cool cakes in pans 10 minutes; remove from pans to cooling racks. Cool completely, about 1 hour. Refrigerate or freeze cakes 1 hour until firm. Meanwhile, in medium bowl, mix 1 container plus 1 cup chocolate frosting with food color to make black frosting. Cut marshmallow in half crosswise. For eyes, attach 1 mint to each marshmallow slice with frosting; set aside. Using serrated knife, cut off top rounded portion of each cake to level surface. Turn cakes cut sides down. Cut cakes as shown in template. Place cake pieces on tray as directed in template, attaching to tray and each other with small amount of frosting. 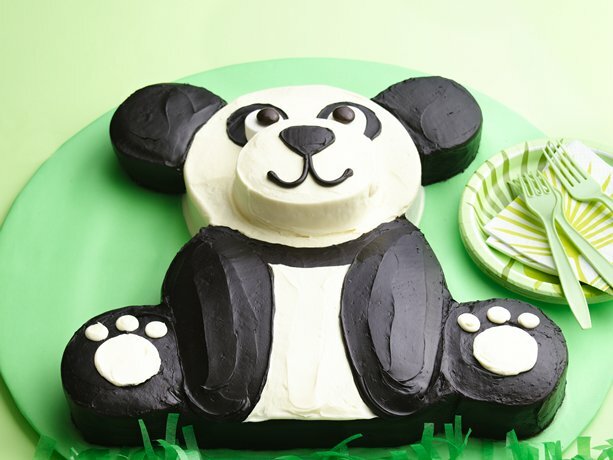 To “crumb-coat” cake, spread thin layer of vanilla frosting over head and thin layer of black frosting over ears, body and paws to seal in crumbs. Refrigerate or freeze cake 30 to 60 minutes. Frost head with some of remaining vanilla frosting. Frost rest of cake with some of remaining black frosting. To pipe on panda features, spoon vanilla and black frostings into separate resealable food-storage plastic freezer bags and cut small tip off 1 bottom corner of each bag. Pipe or spread vanilla frosting on body to create chest. Pipe or spread black frosting on head for patches around eyes. Place marshmallow eyes on patches. Pipe or spread black frosting on snout for nose and mouth. Pipe or spread vanilla frosting on back paws to create paw prints. Pipe outline around body and front legs with black frosting. Fill in outline with additional black frosting so front legs have a thicker layer of frosting than white chest. Using metal spatula, create a different texture on the body and front legs to further define legs from chest and back paws. Bring 6 quarts water to a boil and add 2 tablespoons salt. Peel the fibrous part off the stalks of cardoons and cut each stalk on the bias into pieces 1/4-inch thick. Drop the pieces into the boiling water and cook 15 minutes, until tender. Drain and allow the pieces to cool. Preheat oven to 350 degrees F. In a 12 to 14-inch saute pan, heat the oil over medium heat until smoking. Add the onion and cook 7 to 9 minutes, until soft and light golden brown. Add the cooked cardoon pieces and cook until very soft, about 10 more minutes. Remove from the heat and cool. Place cool cardoon mixture into a mixing bowl and add besciamela, eggs and yolks, ricotta, and 1/4 cup Parmigiano and season with nutmeg, salt and pepper. Butter a bundt cake pan and sprinkle with breadcrumbs to coat. Pour the cardoon mixture into the prepared pan and place it in a roasting pan. Pour cool water into the roasting pan to come up 3 inches on the side of the bundt pan, and place it in the oven. Cook 1 hour, until sformato is just cooked through, then remove. The sformato is cooked when a toothpick poked into the center exits clean. Allow to rest 15 minutes before edging with a thin knife and turning out onto a plate. Sprinkle with toasted bread crumbs and remaining grated cheese before serving warm.